Triple meaning. This is the place for Cool Jerk media (i.e. press, like book reviews and interviews), for THE media (i.e. press releases for reviewers, reporters, interviewers and other inquiries) and media (i.e. multi-media, like various image and sound files you can download). 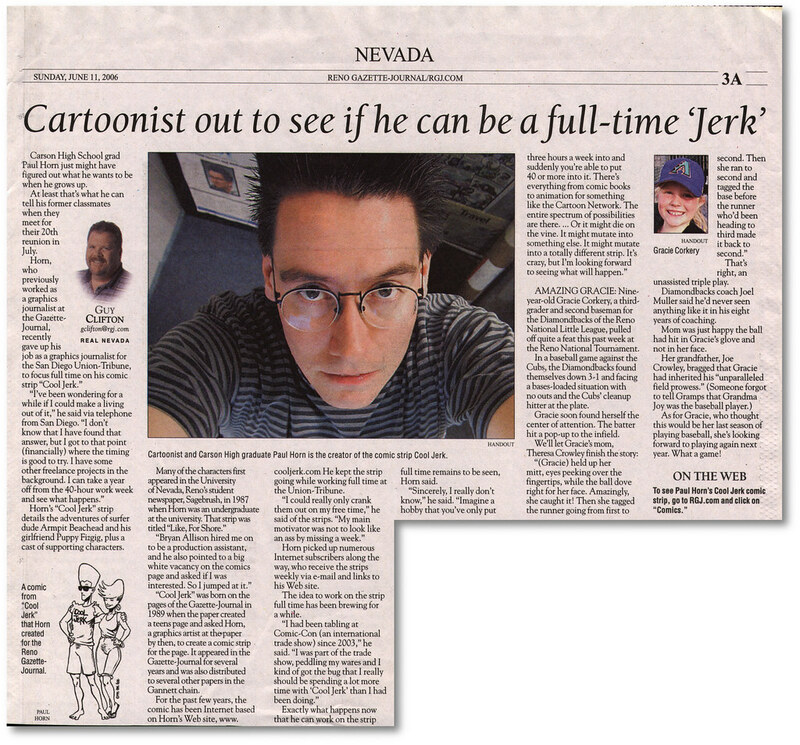 • Brief write-up on me and Cool Jerk, preceding Reno’s first comic convention. Reno Gazette-Journal, Nov. 19, 2014. • Nerd For A Living’s podcast featuring Darlene and me, where we discuss the comic business, conventioneering, selling our books and other items of interest. Sept. 2013. 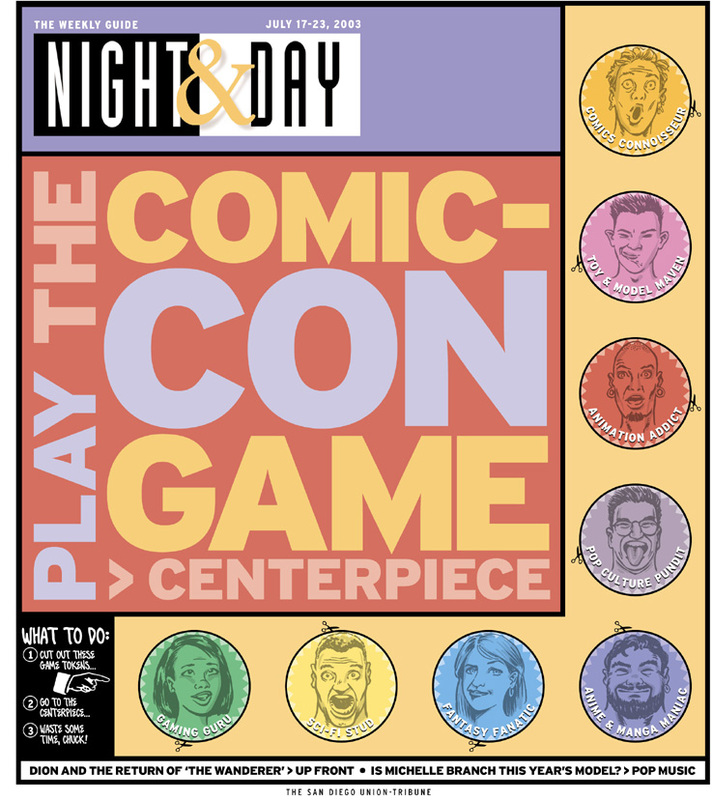 • Not really an interview or review, but here’s a piece I did for the U-T San Diego, talking about Comic-Con and Small Press. This originally saw print as the Sunday Business cover, July 14, 2013. • I show up here at around the 9-minute mark, where I talk about Southern California Comics (San Diego) and Cool Jerk books. July 2013. • Drunken Donuts? Laughing Squid chats about Darlene’s and my donut shooters and The Girl with the Donut Tattoo, Nov. 2012. • Audio review of The Girl with the Donut Tattoo via The Comic Book Noise Family podcast, Sept. 2012. • Nice write up on The Girl with the Donut Tattoo by Brigid Alverson/Robot 6 blog at Comic Book Resources, July 2012. • Darlene and I talk about self-publishing (Cool Jerk, The Girl with the Donut Tattoo) on San Diego City Beat, by Amy T. Granite, July 2012. • Feature story on The Girl with the Donut Tattoo by Candice Norwood, U-T San Diego, July 2012. 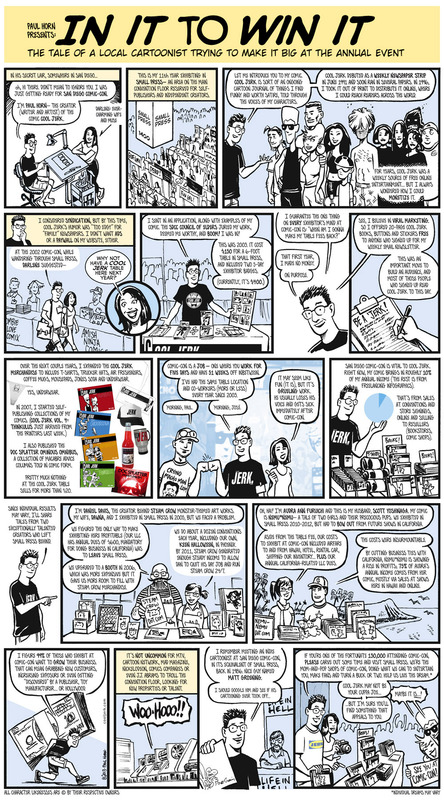 • Nice little write-up about a store signing for Defective Geeks, Oct. 2011. • Chatting about the San Diego Comic-Con Small Press experience, with LAWeekly staff writer Liz Ohanesian, July 2011. 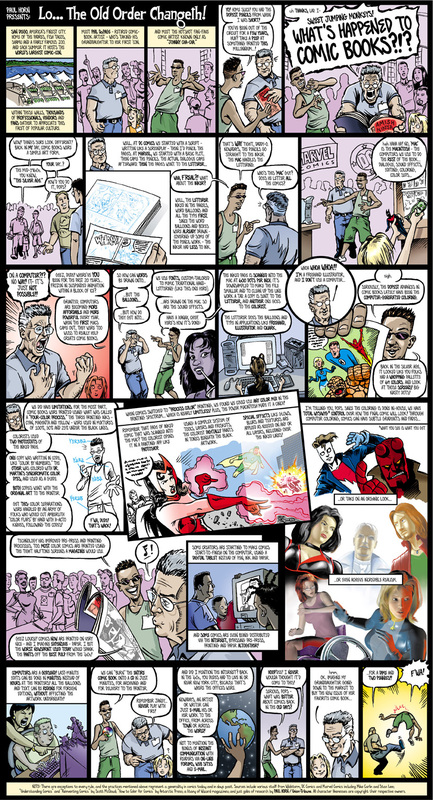 • MTV Geek feature on Cool Jerk and online comics economics, by Sean Kleefeld for Kleefeld on Comics, Feb. 2011. • Bleeding Cool video interview, San Diego Comic-Con, summer 2010. 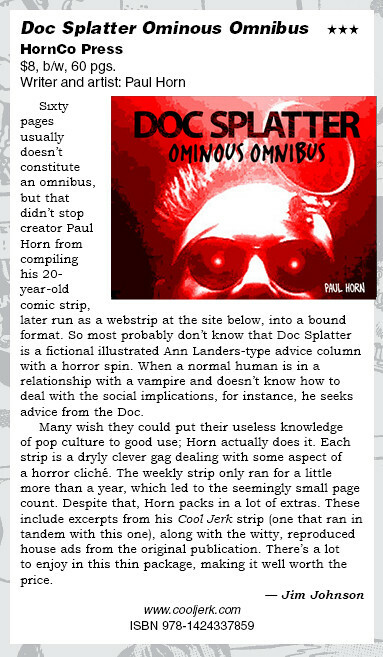 • Jim Johnson review of Doc Splatter Ominous Omnibus, Comics Buyer’s Guide #1666 (April 2010). • The Comics Waiting Room video interview, San Diego Comic-Con, summer 2009. • San Diego Uptown News interview, summer 2009. • Square TV video interview, San Diego Comic-Con, summer 2008. 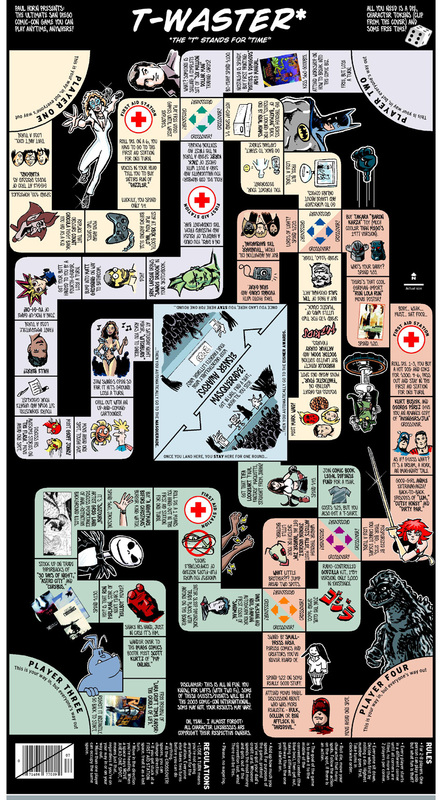 • Marc Mason/The Comics Waiting Room interview, 2008. • Matt Becker/Vintage Caveman talks a bit about Hodabeast and Chickadoowa, 2008. • Leesa Hanagan/Sequential Tart reviews Hodabeast, 2008. • Luke Foster/The Pulse reviews Hodabeast, 2007. • Sean Kleefeld (Kleefeld on Comics) discusses Hodabeast, 2007. • Comic Talk Cafe podcast interview, 2007. • Marc Mason/The Comics Waiting Room review of Hodabeast, 2007. • Earthdog’s Sad Salvation blog, where he chats about Hodabeast, 2007. • Reno Gazette-Journal interview/article, 2006. • Gannetteer feature on Cool Jerk, shortly after its Gannett launch in 1993. • A few more brief reviews and mentions I rescued from dead pages on the Internet. • Caught in the act at Isotope, San Francisco, 2009. • USAToday Pop Candy blurb regarding a Cool (Jerk) run-in with Seth Rogen, 2007. 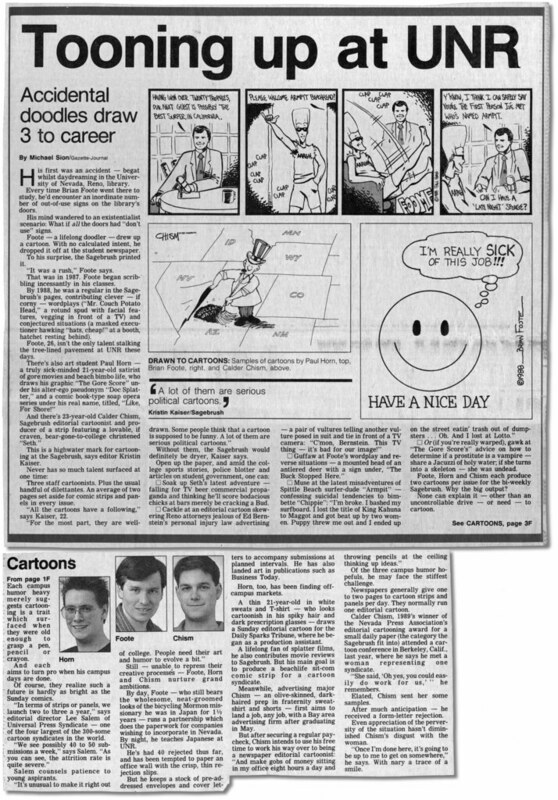 • Reno Gazette-Journal feature on some would-be cartoonist-types from UNR, April 7, 1990 (!). 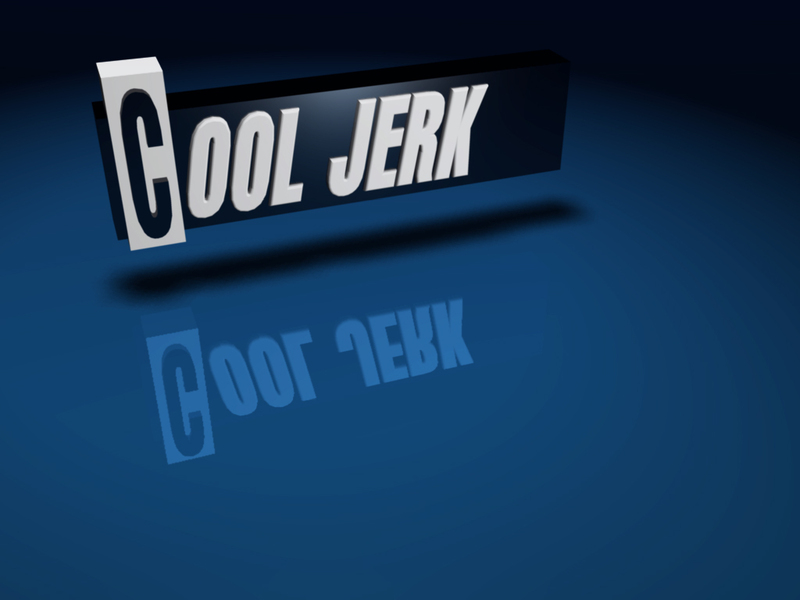 Here’s the one-stop shop for various Cool Jerk-related downloadable media! 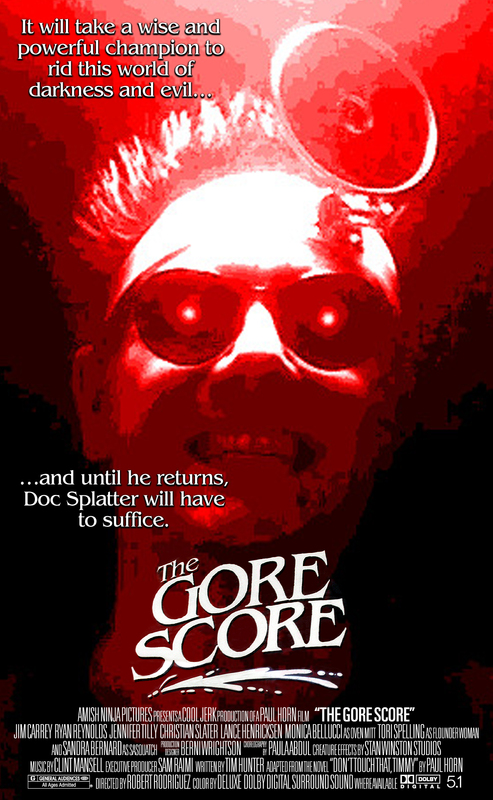 • The Gore Score movie poster! 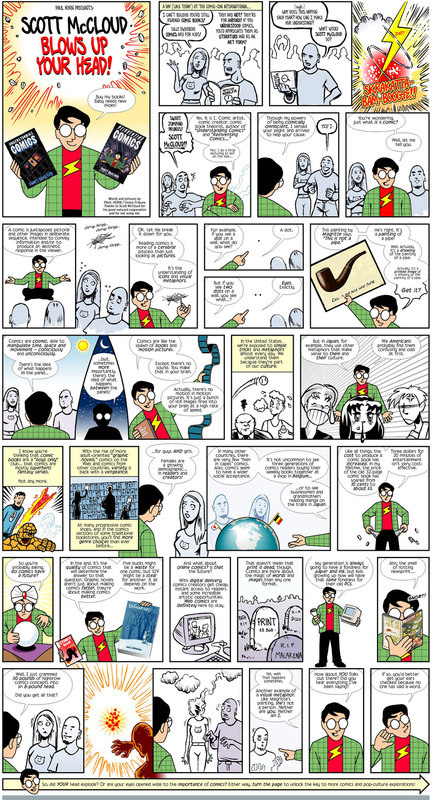 • Poster-size SDCCI comic 2001! • Poster-size SDCCI comic 2002! • Poster-size SDCCI comic 2004! • Poster-size SDCCI comic 2005! • Poster-size SDCCI comic 2013!